Southeastrans is one of the great places to work if you enjoy a challenge and want to be a part of helping others. Our offices are located throughout the southeast United States and headquartered in one of the top metropolitan cities in the U.S., Atlanta, Georgia. We are looking for professionals who take pride in achieving excellence and creating a work environment that feels like family. Check out our Job Search below and let’s see how we can work together. Our Call Center Representatives live and breathe customer service! They are committed to excellence, enjoy helping others and working in a fast paced environment. Call Center employees are responsible for scheduling transportation, partnering with health care professionals and facilities, routing trips and reconciling claims. If you have a background in customer service, dispatch, or data entry and possess the skills listed, we have a place for you on our team! View our new video on Customer Service. 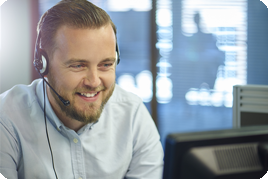 Listen to our employees share their personal experiences about their connection with our Call Center and the company culture that’s like family. Be inspired to join our team!